this actually made me laugh out loud. what a hoot! I was laughing and that is good; on no it is bad because I have a cold and it makes me cough and my ribs are hurtin’ from all that coughin; but it was worth it. Erm……..that part about the bushy eyebrows is spot on. I should know. My ex husband barely had a forehead his eyebrows were so big. I can’t even tel you how many roses I got before we divorced. Now I can’t stand to look at them, but these are really very beautiful. lol :o) u know I remember that night making flowers in the basement with you girl! now I got t run and check out the rest of your blog to see what else you r cooking up! These are great, can’t wait to try it out! ps why no blue toothpaste? HAHAHA! Love it! Love the cat-child too. And LOVE the roses. I’ll be linking. These are beautiful and the perfect thing to add to the bedside table before photographing our bedroom! Thanks for the tutorial! Complete madness and hilarity, plus a genius craft! Using that green tape is the cleverest thing. What glorious flowers! Every gal needs a Romanian gypsy woman to teach her some sage womanly secrets just like every gal needs to learn how to make coffee filter roses to perk up any room. I need to make some peonies this way! Thanks everyone, I’m so happy you like them!!!! Jills– the toothpaste thing has something to do w the blue dye getting into your bloodstream through your gums…. I’m sure it’s a conspiracy theory, but I tell you, it has prevented me from buying non-white toothpaste ever since!! Wonderful! I sense a crafting day in my near future. Thank you! Hi, I visited the blog and I love the paper flowers that you taught to do. ‘ll Ever come back to see what’s new. love,love,love! A snagged some coffee filters at my mom’s house on the last visit, and they’re just waiting…..thanks so much for linking up on Craft Schooling Sunday, truly great to have you! Sara, you know I just love to link up at your site! Thanks for providing such a great forum. Are you kidding? These are gorgeous!! Thank you, for the story and the roses! I loved making these! Thanks for sharing. These are simply stunning! Thanks for sharing … I’ve posted a link. We are doing the giant ones for a friend’s 54 th birthday celebration. A little red wine, some chocolate fondue, and your rose project! So gorgeous! I love them. I’m listing this in my Craft Inspiration links this Monday. Absolutely beautiful. I think every house should have some. Thank you for the wonderfully clear instructions, and the hilarious story. I wanted to share this with you I hope the link works right. Love, love, love this post!! thank you so much for entertaining us with you story and all those tips on how to sell!!! lol Oh how I wish I had known Tanja! I love these! Tell me, what size are the regular coffee filters? I used large coffee filters, and got large flowers. If you want a medium-size flower, you could probably just use medium-sized coffee filters. However big the filter, the size the flower is. The filter is like the flower, only squashed flat without any creases. 🙂 Hope this helps! Found your post on pinterest! LOVE this, so fun! I love your story…totally made me laugh! Love the huge wedding cake image with “chicken cutlets”. OMG!! I love these flowers so much! So much so, that I made some for my daughter’s birthday this past sunday. Check out my flowers on my blog here: http://laidoffmom.com/entertaining/coffee-filter-flowers/ And like any good blogger would, I referenced you and your great site! Luv u to “Peaches”! Love your website Ms Peaches! You are adorable, and very creative. Thanks for sharing! You can dry your filters in the dryer, just 2 to 3 minutes only. Your wit and writing and tutorials rate an A+++. I love this tutorial and the story behind it. I don’t think I’ll ever forget it! I NEVER MADE COFFEE FILTER FLOWERS UNTIL THIS WEEK . I HAVE BEEN SEACHING FOR SOME IDEAS . YOUR FLOWERS ARE THE BEST . THANKS FOR SHARING YOUR IDEA. Thank you so much Peaches! You & I have a lot in common, & I love your stories & tutorials. If I’m not mistaken, like me, you only have 4-legged furry children & you are an aunt. My niece is 12 yrs old & just finished batteling her SECOND bout with cancer (she was only 8 yrs old the 1st time). Yesterday we spent the day together, just the 2 of us making your coffee filter flowers. We had so much fun! Thank you peaches for helping me have a wonderful day with my neice! I have a lot of ideas running through my mind to use these flowers – they are great. thank you so much. been searching for paper flower ideas for my wedding. yours is the most helpful. going to try this. thank you! I love your story about roses; I can’t wait to start making them. They are beautiful and creative. Look so real. how wonderful is your art….thank you!! I am so eternally grateful for finding your site. I spent hours on youtube the other day, searching for paper flowers and settled for some so-so looking ones. Then I somehow mucked about and found you…and I am so thrilled. I have found exactly what I wanted!! 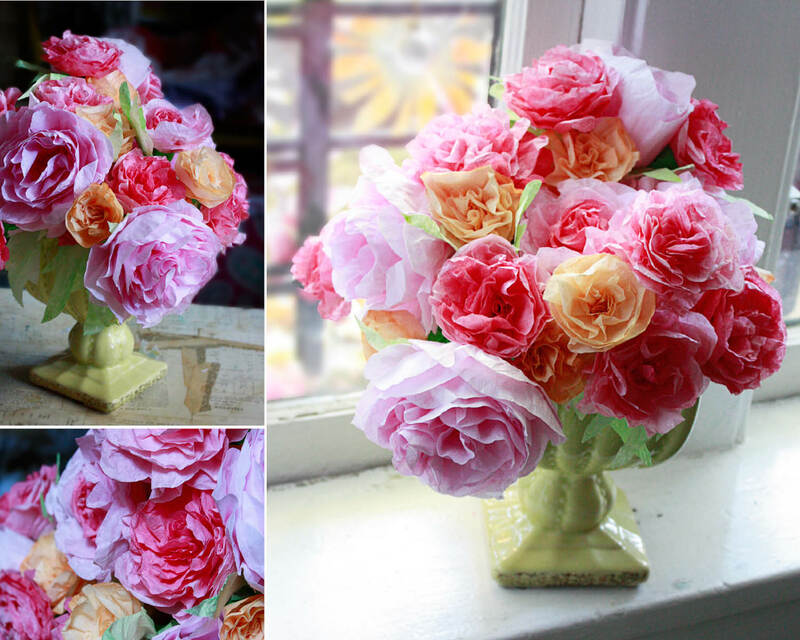 I made a whole lot of coffee filter pink flowers yesterday, but now that I have found these roses, I am going to make them, too. And how I love to read your words!! Usually I skim-skip all the bloggy stuff, but you are so funny I like to die. I can’t wait to share your 50-pairs of black socks rant with my daughter who has so much ManTrouble!! She really needs a fresh perspective! All in all I am just so grateful to have found you and please never stop this site!! Thank you. Can’t wait to try! I am decorating for a Girls’ Retreat at my church and had been looking for inexpensive flowers. This is perfect. And when the retreat is over the girls can take them home as a memento of the event! These are the most beautiful flowers!! I am so excited to make them. What girl doesn’t like roses. Thank you for the tutorial. I showed my granddaughter and she agreed that these were the most beautiful roses and we cant wait to craft together. Thanks for sharing. You are an inspiration! I don’t know if I understand the question — but the large filter = large spiral = large flower. If you keep the width of the spiral the same as smaller ones, yes, it would just come out narrow. I just saw these in my Facebook feed and I totally thought that they were real! Beautiful. Sharing and Pinning! Hey 😀 I absolutely loooove this tutorial! A few quick questions though (I am so rubbish at crafts you have no idea!) Would coffee filters that are designed for machines work, the ones that are like little cones? Also, how do you stick the filters to the masking tape? Or do you put it onto the sticky side of the tape? Hope you can help, I’d love to make some blue one of these for a show I’m directing! Would be perfect props for stage shows! Hi Annna — The pattern relies on a circle so you really need regular round filters. I imagine you could pull something together using the cone shapes, but that’s not the tutorial here. And yes, use the sticky side of the tape. Good luck! These roses are beautiful and they look so real. Thanks for the fun story, as well! What a hoot! Love this idea, back in the day we used colored crepe paper cut into pedal shape leaves and attached each by hand stretching the middle with our thumb to get a realistic looking flower, they were beautiful.your method would be easier and faster but I’d use crepe paper to eliminate the painting &drying step. Thanks for sharing I can’t wait to try this. So beautiful! Love your site. you look like you could be twenty years old. These are gorgeous! And look easier and simpler than other coffee filter roses I’ve seen! I’m wanting to make a flower garland, attaching the roses to ribbon or string. Do you think that would be possible? Or would they unravel? Do they only stay together because they are taped to the straw?